The Arctic Grayling (Thymallus arcticus) is a species native to northern North America. The only populations native to the lower 48 states were in Michigan and Montana, and the Michigan ... morepopulation is now extinct. 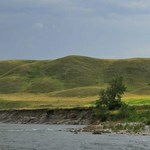 Consequently, the fluvial or river-dwelling population in the upper Big Hole River are the last remnants of this native Fish of Special Concern. 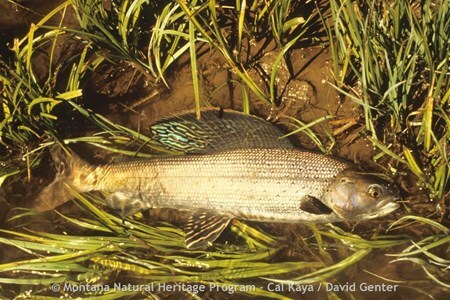 Originally, the fluvial Arctic Grayling was widespread throughout the upper Missouri river drainage as far downstream as Great Falls. 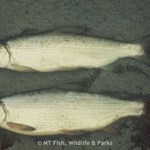 Lewis and Clark made note of these "new kind of white or silvery trout" in 1805. The lake-dwelling form is fairly common in 30 or more lakes across the western half of the state. These lake fish are genetically, but not visibly, different from our native fluvial Arctic Grayling. Grayling are gullible to the angler's lures and also seem to be easily out-competed by other salmonid species. This probably explains much of their demise from their native range. 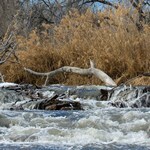 They are spring spawners and broadcast their eggs over a gravel bottom in moving streams. 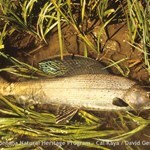 Grayling can overpopulate, producing severely stunted populations in some mountain lakes. Grayling are truly a unique Montana species. The iridescent hues of a spawning grayling's dorsal fin are brilliant. Exceptional individuals can weigh up to 3 pounds and reach 20 inches in length. 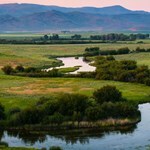 They are generalists, eating a variety of aquatic invertebrates (Montana Fish, Wildlife, and Parks). 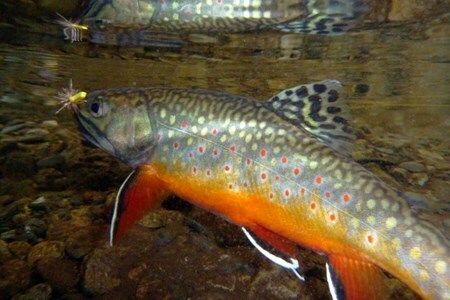 The "brookie" or brook trout (Salvelinus fontinalis) was introduced to Montana from eastern North America in 1889. It too, was extensively propagated and stocked in the early half ... moreof this century, although seldom so today. 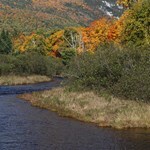 Brook trout favor small, cold, headwaters streams and ponds, particularly those that are spring-fed. 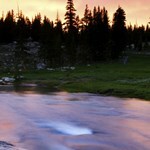 Brook trout are common throughout most of the western two-thirds of the state in all major drainages. 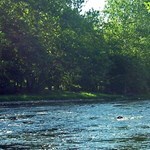 Many an angler learned to fish for brookies as a kid. Spawning occurs in typical trout-like fashion with eggs deposited in a gravel redd during the fall. Brook trout are frequently able to spawn successfully in ponds which have upwelling springs. Brook trout will eat nearly any living organism, and larger fish can be voracious predators on other fish and even their own young. Brook trout are a handsome game fish in their own right, but indiscriminate stocking in mountain lakes has resulted in irreversibly stunted populations in many cases. 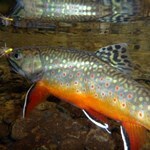 Trophy brook trout up to 9 pounds have been taken in Montana waters. The brown trout (Salmo trutta) belongs to a different genus than our native trout species. They evolved in Europe and western Asia and were introduced to North America in 1883 and ... moreto Montana in 1889 in the Madison River. 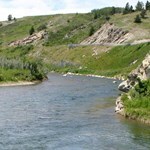 Today brown trout are found throughout most of Montana except the northwest and parts of the east. 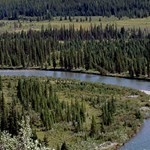 Generally, they prefer lower gradient, larger streams than cutthroat and rainbow, and they also do well in many reservoirs. 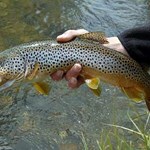 Brown trout were widely stocked in the first half of this century, but today most come from natural reproduction. 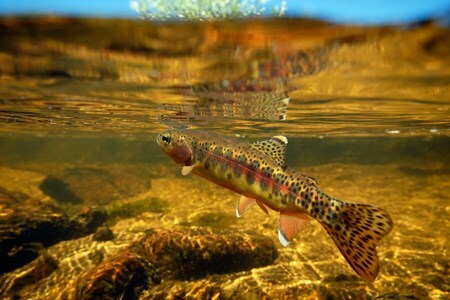 Brown trout are great competitors and generally are more tolerant of dewatering and other environmental disturbances than our other trout species. The state record is 29 pounds, and large fish are not at all uncommon, although 12-20 inches is the usual size range of adults. Brown trout spawn in gravel redds like our native trout but their spawning season is in the fall. This gives them a distinct advantage in some habitats since their spawning and incubation period lies outside the irrigation season. 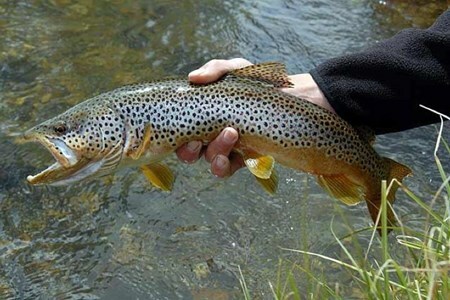 Brown trout are more predaceous than rainbow or cutthroat. Large fish often feed at night on other fish as well as crayfish and other invertebrates. 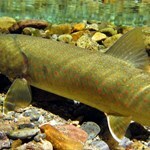 The native Bull Trout (Salvelinus confluentus) has been determined to be a separate species from the coastal Dolly Varden. Bull Trout are found in the Clark Fork and Flathead drainages ... moreof western Montana, and their slowly declining trend has led to their designation as a threatened species. 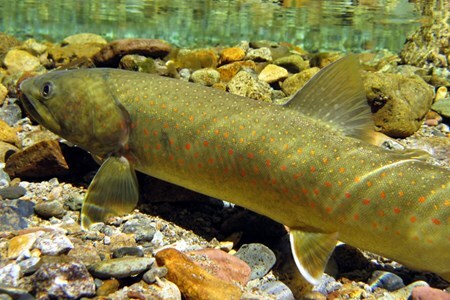 Bull Trout are a sensitive species that do not tolerate high sediment levels in their spawning streams. Sediment can suffocate the developing embryos before they hatch. In Flathead Lake, where they achieve trophy sizes of up to 25 pounds, the Bull Trout life cycle has been studied extensively. Adult Bull Trout ascend the North and Middle forks of the Flathead River to spawn in small tributary streams; in some cases traveling well over 100 miles in a few months. They spawn in the fall and the adults return to the lake. 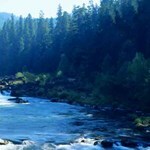 Young fish may spend up to three years in the tributaries before returning to mature in Flathead Lake. 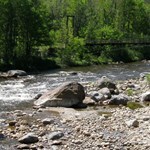 In other river systems, Bull Trout may be a resident stream fish. Often, native Bull Trout have been displaced through competitive interaction with introduced Brook Trout. Bull Trout and Brook Trout will interbreed, resulting in sterile hybrids, which leads to a further decrease in Bull Trout populations. 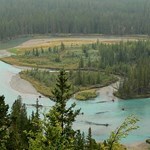 The Bull Trout may be considered the Grizzly Bear of the fish world in relationship to its need for unaltered habitat. Young Bull Trout feed primarily on aquatic invertebrates but adults eat mostly other fish (Montana Fish, Wildlife, and Parks). Resident adults are 15 to 30 centimeters in length whereas migratory adults commonly exceed 60 centimeters (Rieman and McIntyre 1993). 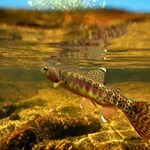 The golden trout (Oncorhynchus mykiss aguabonita) is a California species that was introduced in Montana in 1907. There are currently about 20 golden trout populations in the high ... moremountain lakes of western and southcentral Montana. They provide a unique opportunity to catch a beautiful fish in a pristine environment. 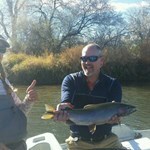 Golden trout up to 4 pounds have been caught in Montana but typical size is usually 6-12 inches. Golden trout are spring spawners and can usually be found in inlet or outlet streams to high mountain lakes around the Fourth of July. Like other mountain lake trout species, they are opportunistic feeders, surviving off a variety of aquatic and terrestrial invertebrates. 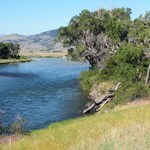 One of two Pacific salmon species in Montana, the chinook salmon (Oncorhynchus tshawytscha), was introduced into Fort Peck Reservoir during the 1980s in an effort to produce a trophy ... morefishery. 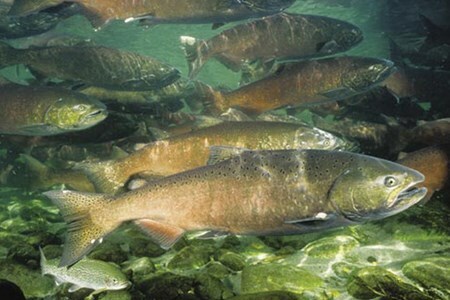 Like all Pacific salmon species, the chinook dies after spawning. It is doubtful that these fish will reproduce in Fort Peck, but due to their intense homing instinct they will return to where they were stocked when they are ready to spawn. They may then be captured and artificially propagated in the hatchery. While still experimental, chinooks of over 25 pounds have already been captured in Montana. Chinook, also known as "king salmon", are intense fish predators as adults. 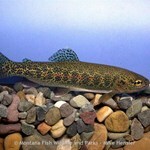 Cisco (Coregonus artedi) is Montana's newest fish species. 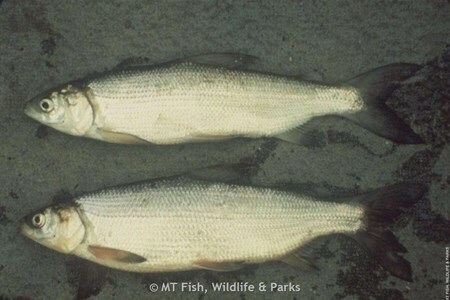 They were introduced by the Montana Department of Fish, Wildlife and Parks into Fort Peck Reservoir in 1984, from Saskatchewan, ... moreto act as a forage fish for walleye and lake trout. They have produced a rapidly expanding self-reproducing population. Studies are ongoing to determine the value of cisco as a forage fish. Cisco, also known as lake herring, are widespread across eastern and central Canada. They spawn in the fall in shallow water. Cisco are an open water or pelagic species, forming large schools at medium depths where they feed mostly on plankton. 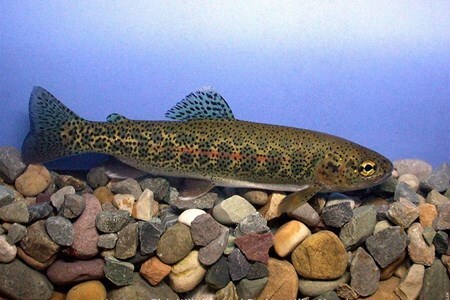 Columbia River Redband Trout (Oncorhynchus mykiss gairdneri) are a native trout of western North America. There is considerable variation in the life history in this group of trout. 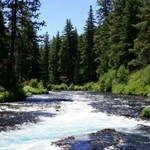 ... moreResident stream populations are found throughout the Columbia River basin. 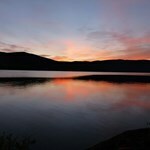 A lake variation known as Kamloops are found in some larger lakes in the Columbia and Frasier River (British Columbia) basins. A third variation is the steelhead that migrated from the ocean as far as the upper Snake River, Idaho (almost 1000 miles) (Behnke 1992). 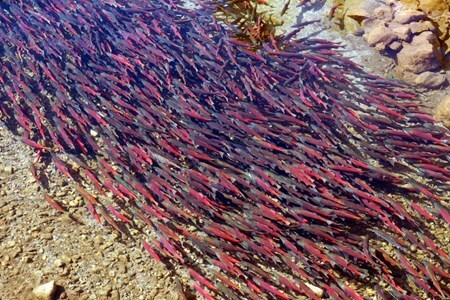 The kokanee is the landlocked version of the sockeye salmon. Kokanee were first introduced into Montana in Flathead Lake in 1914 and are currently fairly widespread in the western ... morehalf of the state on both sides of the Divide. 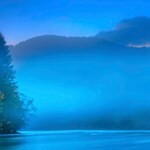 Kokanee can achieve sizes of 3 to 5 pounds but 1-pounders are most common. The size of kokanee in Montana waters is a function of two factors, their own population density and the abundance of their available food supply. 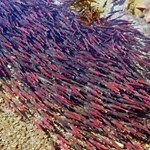 Kokanee are strictly plankton feeders and they can rapidly overpopulate, resulting in large numbers of stunted fish. 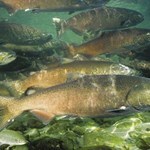 Kokanee spawn naturally in many Montana waters. They either run upstream from their lake habitat or spawn along the lake shorelines in the fall. Most kokanee reach sexual maturity in their fourth year of life and they then undergo a dramatic transformation prior to spawning. The silvery specimen seen here becomes a smooth-skinned, red-colored spawning fish with large hooked jaws and teeth on the males. All the adults die after spawning, making for a tremendous food source for bald eagles, grizzly bears, and other animals. Kokanee are very sensitive to water temperature and school in lakes at a certain depth. 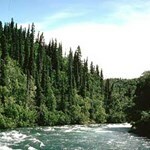 Once located, they are readily caught and provide excellent sport as well as table fare. 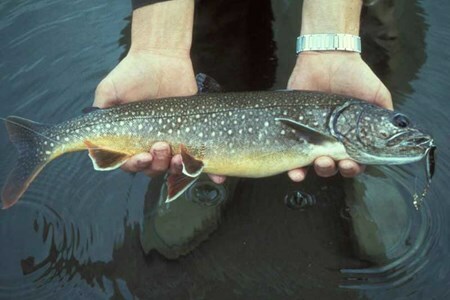 The Lake Trout (Salvelinus namaycush) is a char of the same genus as Bull Trout and Brook Trout. Lake Trout are native in the St. Mary and Missouri River drainages and have been introduced ... moreto a few other scattered mountain lakes, Flathead Lake, and Fort Peck Reservoir. 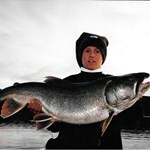 Lake Trout are a major game fish in much of Canada and were at one time a staple of the Great Lakes fishery. In Montana, the Lake Trout of Flathead Lake have achieved trophy status, growing to 42 pounds. 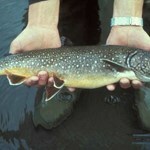 Lake Trout inhabit very deep, cold lakes, living in water up to 200 feet deep. They spawn in the fall on the rocky substrate of the shoreline. They scatter or broadcast their spawn, a rarity in the trout group. Small Lake Trout feed on plankton and aquatic invertebrates but fish over 2 to 3 pounds eat a fish diet. Lake Trout are a highly-prized food fish in Canada and are catching on as a game fish in Montana with the advent of downriggers, electronic fish finders, and other specialized techniques.